PHOENIX – Nearly two dozen John C. Birdlebough High School students were honored recently for their leadership and volunteerism during the President’s Youth Service Awards ceremony. 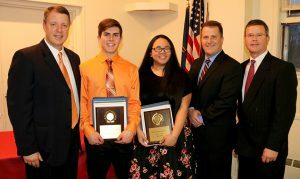 Phoenix Central School District administrators and board members were on hand during a recent ceremony to congratulate Youth of the Year recipients Josh Margrey and Kea Corey. Pictured, from left, are John C. Birdlebough High School Principal Thomas Bailer; Margrey; Corey; Superintendent Christopher Byrne; and Board of Education President Earl Rudy. The 21st annual event, held at the Phoenix Veterans of Foreign Wars Post 5540, recognizes students who have dedicated their time to serve the community. Honorees were lauded for their volunteerism through various activities such as community cleanup efforts, Salvation Army bell ringing, working in soup kitchens, and helping the elderly in local nursing homes. School district officials, elected government representatives and family members congratulated the honorees, who received pins and certificates based on their hours of service. Silver Awards were presented to those who tallied 300 or more hours of volunteer service, while Gold Awards went to students who performed 500-plus hours of service, and Gold Medallion Awards recognized those who spent more than 1,000 hours serving their community. Silver Award recipients included Morgan Bajish, Natalie Hart, Chloe Koegel, Sean Sievers, Kristen Clapp, Brook Jones, Cade Reed and Haley Stellingwerf. Gold Awards went to Breanna Bakus, Madison Doane, Nicole Hetko, Catherine Musumeci, Dylan Blumer, Johnathan Garofalo, Daniel Knowlton and Alisa Trudell. Gold Medallion Award winners were Jordan Cole, James Lynch, Zachariah Neupert, Brooke Ensby and Teona Draper. Recipients of the Presidential Youth Service Awards from Birdlebough High School pose for a group photo after a recent ceremony that honored them for more than 10,000 combined hours of volunteer service. In addition to the gold and silver awards, two students received special recognition as Youth of the Year. The recipients, Kea Corey and Joshua Margrey, were congratulated by Principal Thomas Bailer.